The Oxford Road frontage of the main quadrangle, together with Whitworth Hall on the left. Taken from the south-east. 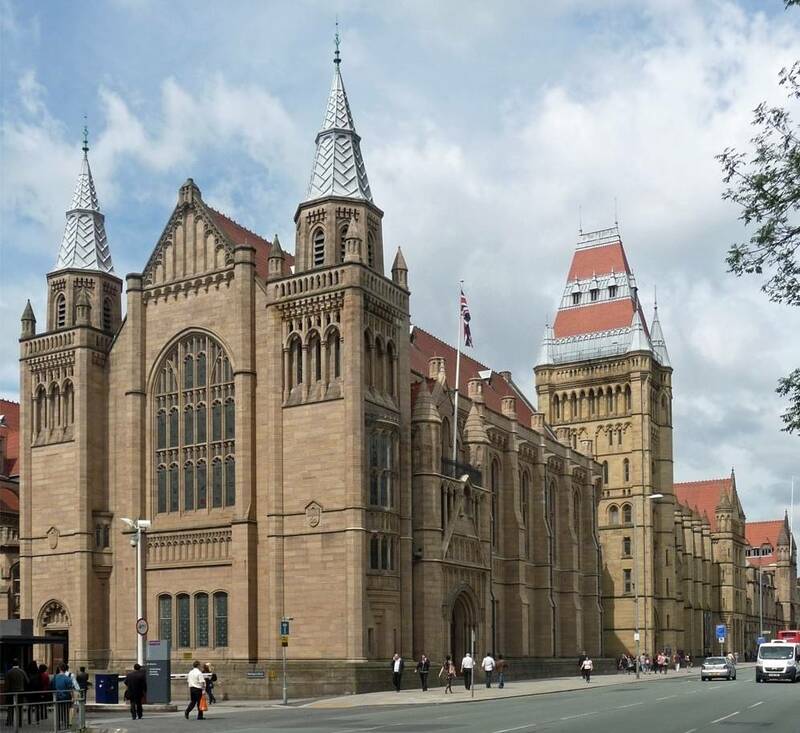 The two central buildings of this range are towards the right here — the tower fronting the Council Chamber, and the museum further right, both by Alfred Waterhouse, 1883-87. These two parts of the Oxford Road range were designed in the second phase of work on the main quad, and stand on the opposite side of it to the John Owens Building. As Sir Philip Hartog recalls: "On November 29th, 1882, a public meeting was held in the Town Hall to launch a subscription for new buildings.... In August, 1883, the extensions were begun; they included the north side of the quadrangle and half the frontage to Oxford Street [sic], as far as and including the tower" (14). Since Oxford Road is the main thoroughfare, these buildings might be expected to look more impressive than those behind them. But there was another reason for their greater dignity. In 1880, Owens College had become the first constituent college of the new Victoria University, which had its seat here. At a meeting in 1885, Sir Lyon Playfair MP, FRS, President of the British Association for the Advancement of Science, put it like this: "Owens College has worthily developed into the Victoria University. Formerly she depended for degrees on the University of London. No longer will she be like a moon reflecting cold and sickly rays from a distant luminary, for in future she will be a sun, a centre of intelligence, warming and illuminating the regions around her" (qtd. in Thompson 511). Line illustration showing the second phase of development from the opposite (north-east) side, as it was originally, before the adjoining buildings were added. The museum is the building with the row of tall pyramidal-topped buttresses, its higher gabled block linking it to the Beyer Laboratory on the north side of the main quadrangle (source: Thompson, frontispiece, cropped at the right-hand side). 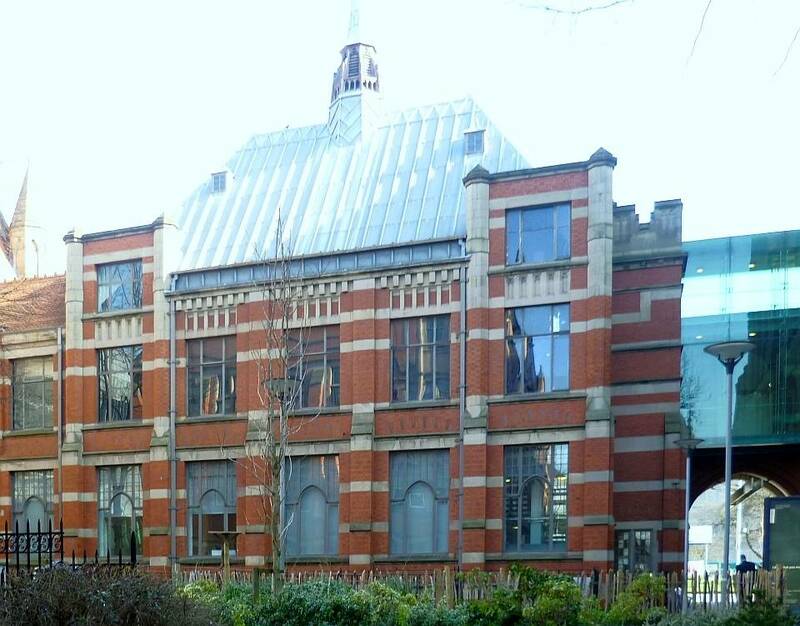 Liverpool joined the new federal university in 1884, and Leeds in 1887 — the former, incidentally, with its own Waterhouse buildings; the latter soon to have one. The grandest building along Manchester's Oxford Road, to the left of the tower in the modern photograph above, came only after these developments. Completed by Paul Waterhouse after his father's death, Whitworth Hall, 1898-1902, with its splendid cathedral-like Gothic window facing Burlington Street at the end, its prominent double-gabled entrance, and its "arcading, friezes and polygonal turrets" (Hartwell 112), fully expressed the importance of the new institution. Left: The tower's exterior, with the entrance archway to the main quadrangle to the right. 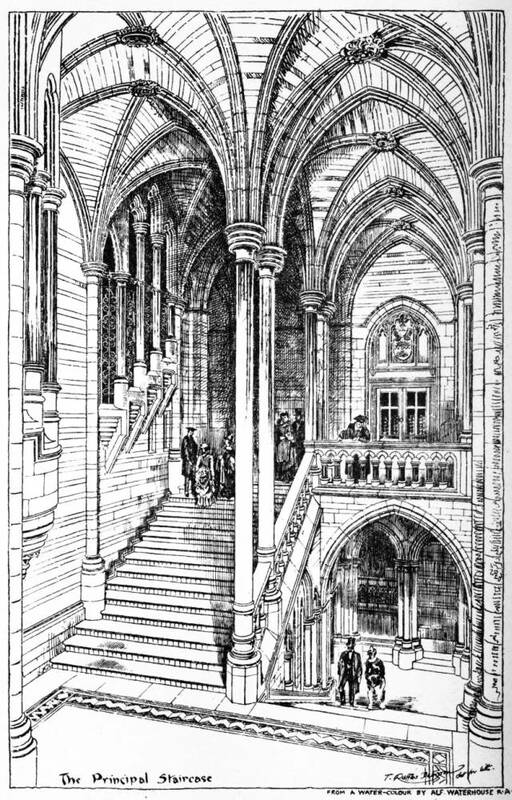 Right: The principal staircase in the tower, from Waterhouse's own water-colour (source: Thompson, facing p. 511). In the middle of the frontage stands the tower, a worthy landmark. Its front wall rises past the statue of the founder John Owens (sculpted by Harry Bates) in a niche over the doorway, through different styles and sizes of windows, to one of Waterhouse's typically steep roofs. This one is graced by pyramidal turrets, tall finials and lucarnes; the banding of red tiles with finely-worked silvery lead is very effective, and nicely echoes the red tiling of the roofs behind it in the quadrangle. The tower fronts the Council Chamber, and the entrance also gives access to the museum on the left, and the Whitworth Hall on the right. The staircase itself is an architectural tour de force. Hartwell describes it as "fascinating," explaining that it gives "glimpses into subsidiary upper caged-in staircases, one of them treated as an oriel" (110), and pointing out that it is similar to the main stairway inside the town hall (see under "Staircases"). Thus, it is yet another example of this architect's "delight in manipulating staircases" (Cunningham and Waterhouse 191). 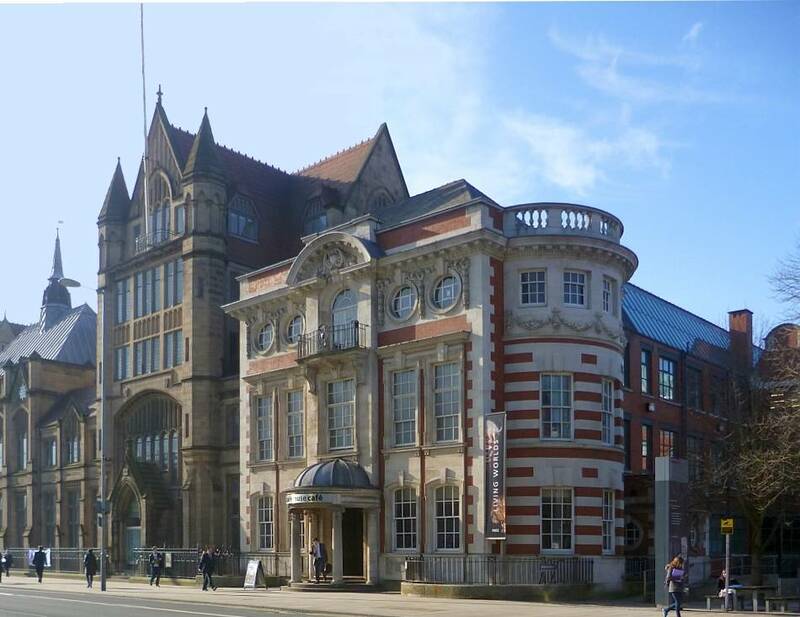 Left: The museum extensions, 1911-27, by Paul Waterhouse, completed by his son Michael, with the former Dental Hospital (Charles Heathcote & Sons, 1908) literally rounding off the Oxford Road range at this end. Right: The rear of the first museum extension. The museum originally housed natural history and geological collections. More space was needed later, so the Waterhouse range was completed by the pavilion-type building on the far left of the first photograph above, with its "steep lead roof and a charming flèche" — and with, as Hartwell observes, an utterly different rear elevation of less distinguished but cheerful red brick with stone dressings (112). The second extension is a match with the last part of the original museum, not entirely the same but also with five storeys and turrets and a gable. The very last part of the present-day museum is another surprise, not by Waterhouse or his dynasty at all but a hugely contrasting Edwardian baroque confection, complete with curves and sculpted swags. This is the former Dental Hospital, which was already there when the extensions were built. 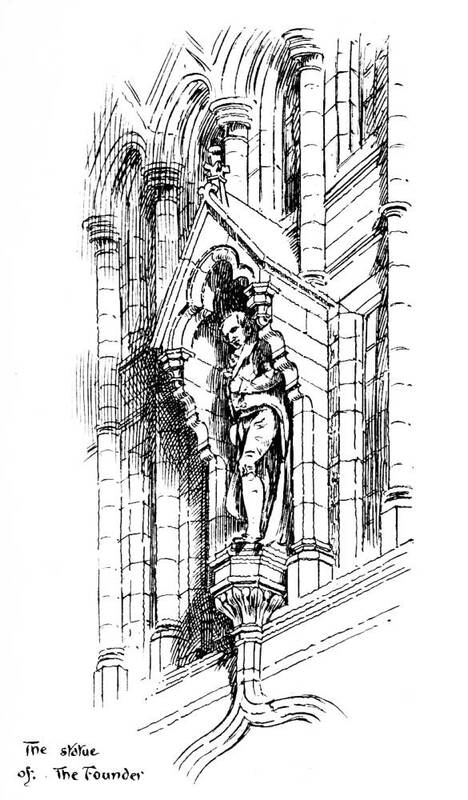 Line illustration of Harry Bates's sculpture of John Owens, over the entrance to the tower (source: Thompson, facing p. 36). Owens's legacy had been enormously fruitful. He had stipulated that entrants to Owens College should not have to be members of the Church of England, and numbers had quickly doubled. Acts of 1870 and 1871 had allowed women to be admitted, and the Charter of 1880 had "fully recognised the equality of women students" (Tylecote 10), though for some time they were still subject to certain limitations. As the college expanded, and more funds were raised from generous philanthropists, the campus expanded too. With the departure of Liverpool and Leeds from the Victoria University, the institution became an autonomous university in 1904, and still more buildings were added, not only some of those shown above, but also, for instance, a fine neo-classical Faculty of Arts building by Percy Scott Worthington in 1911-19. But on the whole nothing measures up to Waterhouse's original quad and its Oxford Road frontage, and perhaps nothing ever will. It has warmth (the west range), presence (the Oxford Road range), and a degree of coherence not found since. Here as elsewhere, Waterhouse demonstrated that he knew how to build a university. Hartog, Sir Philip. 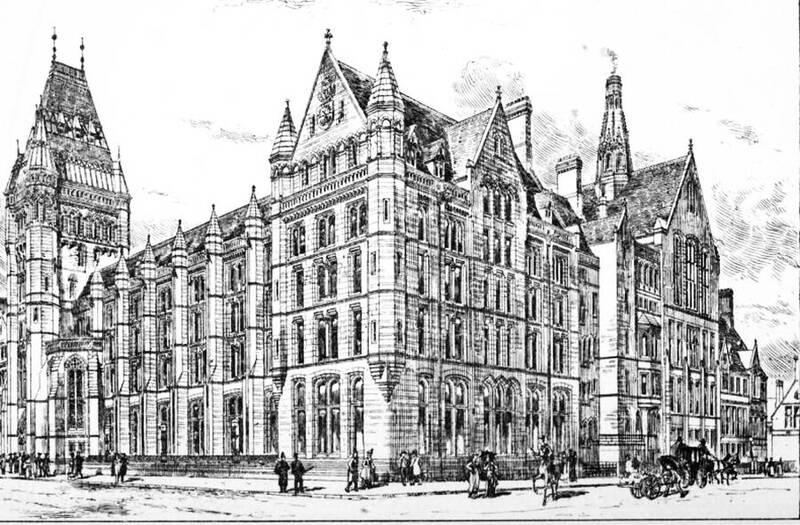 The Owens College, Manchester (Founded 1851); A Brief History of the College and Description of Its Various Departments. Manchester: Cornish, 1900. Internet Archive. Web. 9 September 2012. Hartwell. Clare. Manchester. Pevsner Architectural Guides. London: Penguin, 2001. Print. Thompson, Joseph. Owen's College: Its Foundation and Growth; and Its Connection with the Victoria University. Manchester: Cornish, 1886. Internet Archive. Web. 9 September 2012. Tylecote, Mabel Phythian. 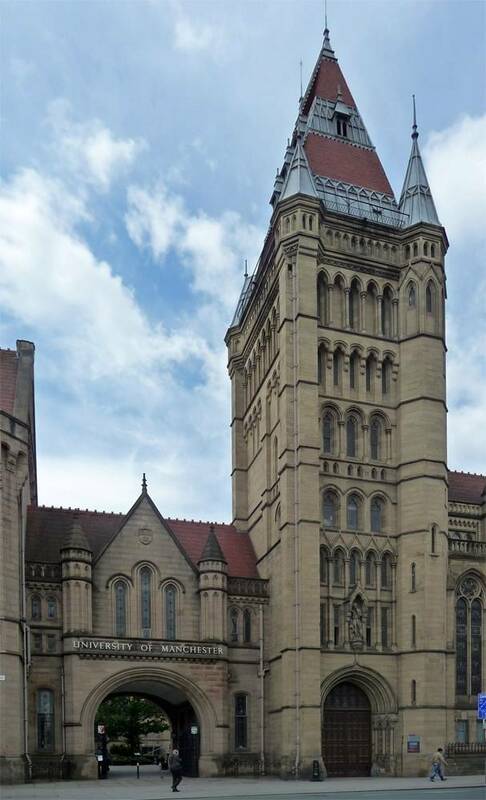 The Education of Women at Manchester University, 1833-1933. Manchester: Manchester University Press, n.d. Google Books (much of the first chapter, on the "Period of Penetration, 1877-1899) is available as a preview). Web. 15 September 2012.